The ICC International Court of Arbitration continues its concerted efforts to narrow gender and cultural disparities. We do this in the belief that more diversity will enhance the arbitration process in the long term and give users of our services access to the very best minds and talents available. 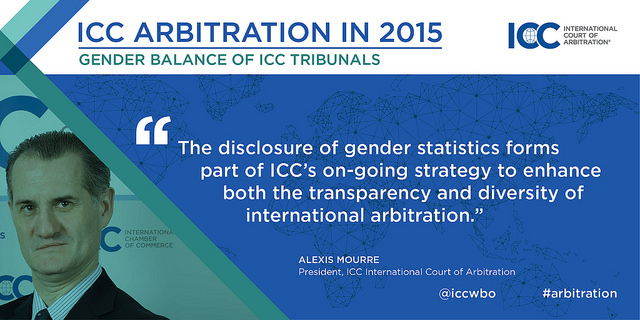 One example of our work in this area includes the disclosure of statistics on the gender balance of ICC tribunals. While the Court’s Bureau has perfect gender parity, women are still underrepresented in ICC tribunals. The disclosure of statistics is undertaken as part of our on-going strategy to enhance diversity of ICC tribunals as well as the transparency of international arbitration more generally. In 2016, the Court introduced a new policy to publish limited information relating to arbitrators sitting in ICC cases. It is hoped that in addition to demonstrating the quality of our tribunals, the information will provide further incentive to promote regional, generational and gender diversity in the appointment of arbitrators – an utmost priority for ICC. ICC has also pledged support for equal representation of women in Arbitration, joining a range of institutions and prominent members of the international dispute resolution community, as a signatory of the Equal Representation in Arbitration Pledge. The pledge sets out meaningful and actionable steps that the arbitration community can take towards rapidly increasing, on an equal opportunity basis, the number of women appointed as arbitrators.